Fans of the Assassin’s Creed games sure were excited when Ubisoft revealed that another entry in the series would be released in October this year. Titled Assassin’s Creed Odyssey, this follows in the footsteps of last year’s superb Assassin’s Creed Origins, and hopefully will live up to 2017’s Egyptian adventure. And as was the case with Assassin’s Creed Origins, Ubisoft will be shipping several editions of the game, including a collector’s edition, something which has become the norm for major video game releases over the years. 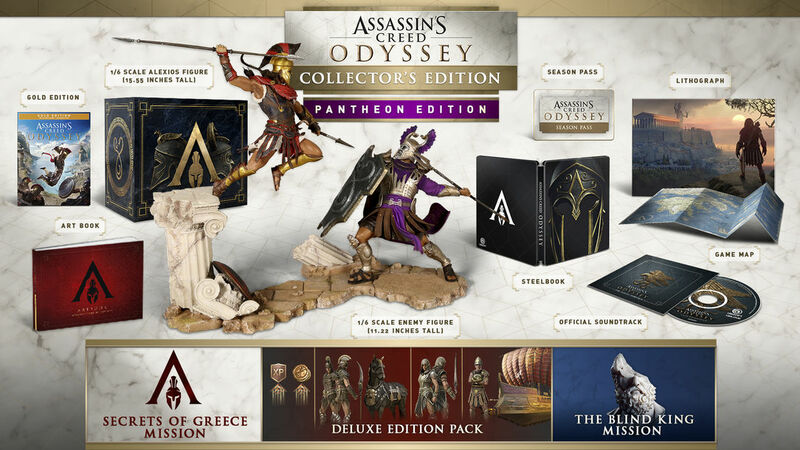 This Collector’s Edition (also known as “Spartan Collector Edition”) includes a plethora of extras that fans will surely appreciate, amongst these being a 15’55” figure of Alexios. This Spartan warrior is the protagonist of Assassin’s Creed Odyssey, and hopefully will be as engaging a character as Bayek of last year’s Assassin’s Creed Origins or the Italian protagonist of Assassin’s Creed II, Ezio Auditore (arguably the series’ best protagonist to date). Aside from the statue, there’s also a map of the game world showing the areas you’ll be able to travel to in the game included in the box. This edition of the game also includes a CD with the official soundtrack. This will surely be worth a listen, taking into account how good the music has been in the Assassin’s Creed series to date (and Sarah Schachner’s score for last year’s Assassin’s Creed Origins sure was great). Additionally, an art book featuring illustrations and concept art from the game comes bundled with this Collector’s Edition. Plus, there’s also a steelbook case containing the game’s Blu-ray in the box too. There are several digital goodies included too, such as an additional mission for you to play in the game (“The Blind King”), plus several gear packs for your character amongst other digital extras. 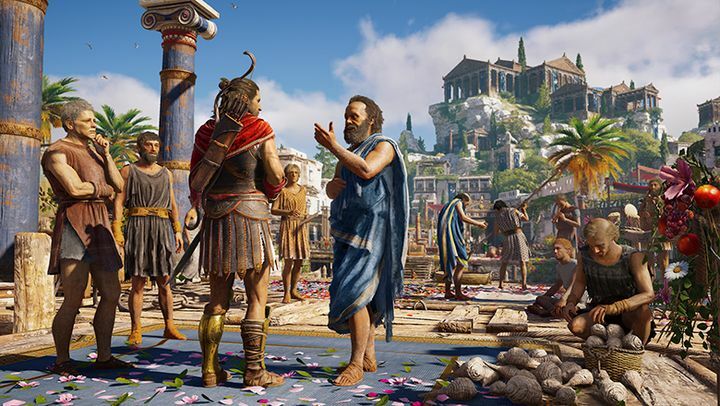 This Collector’s Edition also grants you Assassin’s Creed Odyssey’s Season Pass, meaning you’ll be able to play any upcoming expansions or extra missions Ubisoft decides to put out for the game. Also, if you pre-order this edition of the game (or any other) you’ll get a chance to play the Blind King mission earlier than the rest, something to bear in mind if you’re eager to enjoy this bonus Assassin’s Creed content. 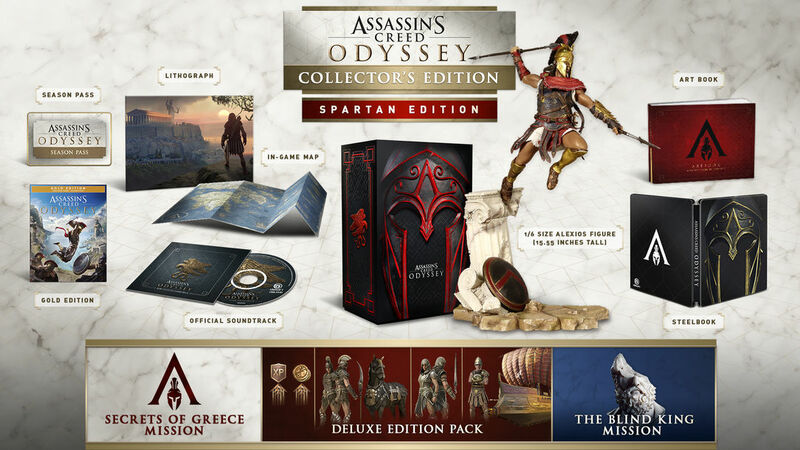 The Spartan Collector Edition is priced at $160 US dollars, and definitely packs a wealth of extras, even if Ubisoft does have a more expensive Collector’s Edition available for those who want to spend extra cash. The Pantheon Collector Edition comes in at $220 US dollars and features the same content as the Spartan Edition, except you get two figures instead of one (see below), and an obviously bigger and more impressive box as well… Bear in mind though, that the Pantheon Collector Edition is currently sold out at Ubisoft’s store, and that these editions of the game are only available for PS4 and Xbox One, and not PC. The Assassin’s Creed Odyssey collector edition will ship on October 2 (earlier than the standard edition of the game which launches on October 5) meaning this is one special edition true Assassin’s Creed fans won’t want to miss, so hopefully Odyssey will be a game that lives up to the hype when it ships this fall.